Heat 12-inch nonstick skillet over medium-high heat. Add bacon; cook 4 to 5 minutes, stirring frequently, until crisp. Transfer to plate lined with paper towels. Drain drippings from skillet, and discard. Add 1 tablespoon of the butter to skillet; sprinkle both sides of pork chops with salt and pepper. Add pork chops to skillet; cook uncovered over medium-high heat 4 to 6 minutes, turning once, until browned (at least 145°F). Remove from skillet; cover and keep warm. Reduce heat to medium; add remaining 2 tablespoons butter and the shallots to skillet. Cook 2 to 3 minutes, stirring constantly, until lightly browned. Add apple cider, chicken broth and bacon to skillet; simmer uncovered 5 to 7 minutes or until liquid is reduced. Add pork back to skillet; heat 1 to 2 minutes or until heated through. Serve with mashed potatoes. 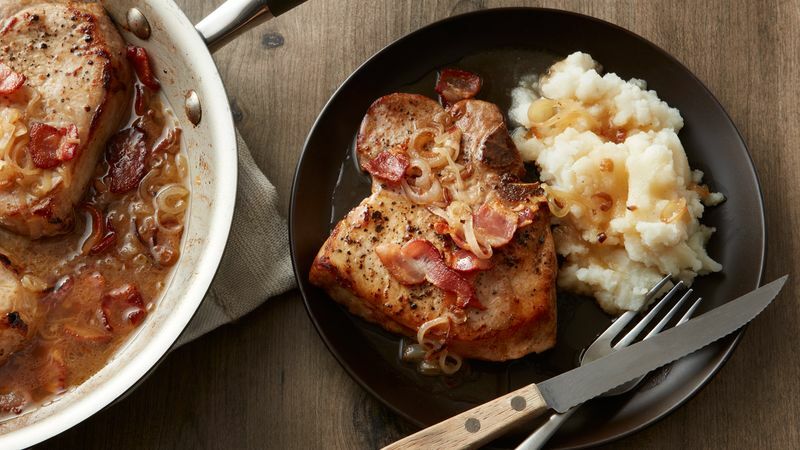 Try using applewood smoked bacon for a nice smoky flavor in the sauce. Cooked wild rice is another great side dish to serve with this meal.